Mark grew up in the window industry at Scientific Window Company. He has many fond childhood memories of working on Saturdays with his father and grandfather and continued to pick up his grandfather on Saturday’s until he retired well past his 90th birthday. Mark got his bachelor’s degree in accounting at Indiana University and practiced as a CPA for two years before returning to Scientific Window. That same year he married his high school sweetheart, Beverly. Returning to Scientific was seamless. He worked with his father and grandfather, and within two years, they had introduced their first vinyl window. Mark continued to work on the technical side of the business until his grandfather retired in early 2000. During the last ten years, Mark spent more of his time concentrating on the daily operations of the company. He also specialized in larger commercial and fire rated window projects. He enjoys talking with customers and solving technical problems, drawing on his years of experience. Mark has three daughters and five dogs (two Dalmatians, two Westies, and a Bloodhound), any of which can sometimes be seen in his office. He spends his off hours boating, watching his kids swim competitively and officiating at their swim meets, hanging around with the dogs, and mopping up Bloodhound slobber. After graduating from Indiana University, Jon worked as a trader on the floor of the Chicago Board of Trade. After eight years operating in that frenetic environment he concluded it wasn’t exactly his dream job. So he got a new one, selling windows, where he found the right fit. Jon stayed with his first window company employer for five years before joining Scientific Window Company in 2000. Jon’s sales philosophy is to educate the customer about the product, and do everything he can to satisfy their unique requirements. His desire is to understand the client, and offer the product that best meets their individual needs and budget. 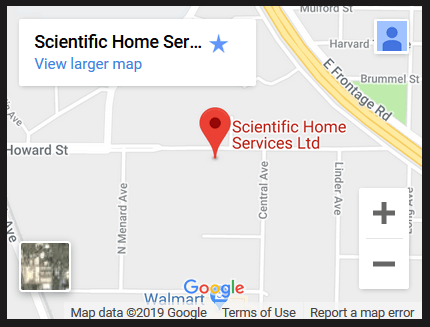 Jon is thrilled to be a partner in Scientific Home Services. His no hard sell approach was a great asset to Scientific Window and he has brought his easy style to the new company. Jon believes that every customer’s time is valuable so his presentations are informative but concise. Jon is married with two daughters and two dogs. His leisure time passions are riding his motorcycle and running. He has run over thirty marathons and ultra-marathons. So if you see him limping a little, know that he runs a lot better than he walks. Jay started at Scientific Window Company as a helper with one of the installation crews over fifteen years ago. After working with the same crew leader for eleven years, Jay went out on his own four years ago. He has done a fantastic job for us, handling jobs ranging in size from one to two hundred windows. He also leads our fire window installations. Jay’s a quiet guy, but don’t let that fool you. Behind that poker face, there is a practical joker. Gilberto started at Scientific Window Company in 2000. He has a very flexible crew that can vary from two to five people, allowing him to handle large or small jobs more efficiently. Gilberto’s skills go well beyond installing windows and include drywall repair, plumbing, carpentry, and more. He has added a complete second floor to his house on the south side of Chicago. Gilberto is a hard worker who takes pride in each job, no matter its size or level of complexity. His pleasant personality, and unique talents and abilities, are why we are so happy he has made the move with us to Scientific Home Services. Victor joined Scientific Window Company in 2006. Beginning with work in the factory, he quickly learned how to assemble the multiple window lines we produced. He then branched out to repairs, first in our shop, and later onsite. He has a natural rapport with customers, many of whom have taken the time to let us know how satisfied they were with his work. At Scientific Home Services, Victor is now permanently on the street as a full time service technician. We are very pleased to have him representing us and addressing our customer’s concerns and repairs. Mike is our newest team member at Scientific Home Services. Originally from Chicago, Mike had been previously employed by Scientific Window Company for 25 years before leaving when the factory closed. We are thrilled to have Mike back with us at Scientific Home Services as a service technician. He brings with him a wealth of knowledge and countless years of hands on installation experience.